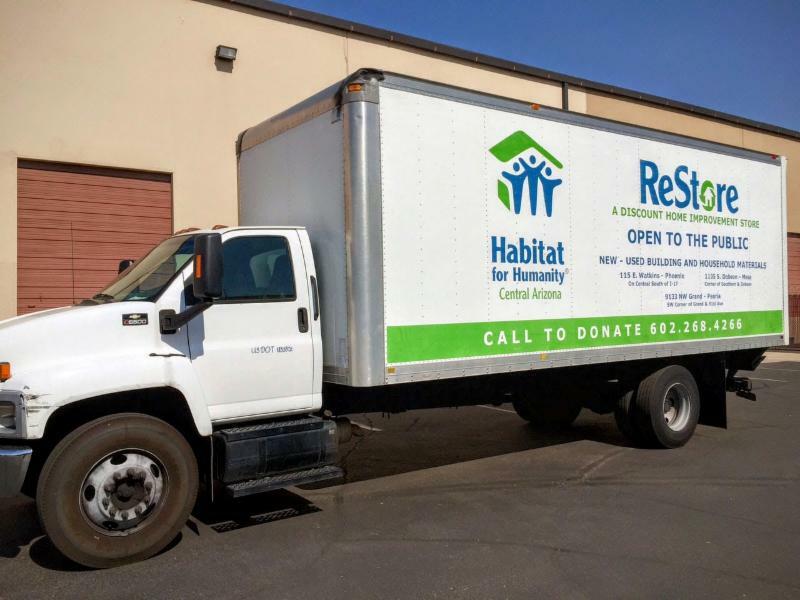 The Restore receives new, used, discontinued or surplus building materials, appliances and home furnishings from companies, contractors, retailers, and individuals. You can donate any used construction supplies and old building material to Habitat for Humanity and we will use proceeds from this tax deductible gift to build houses for low income families in Central Arizona. To schedule a donation pick-up, simply click here. To speak with one of our donations coordinators, call 623-551-6000. Donation appointments fill quickly, so call in advance to ensure your pick-up! We always welcome items to be dropped off at our Anthem, Peoria, Phoenix and Tempe ReStore locations, open daily 8:00am-5:00pm. You will receive an In-Kind donation receipt listing all of your donation items. CABINETS (no built-in, backless units. Doors and drawers attached). CARPET (New only/Must be rolled inside out w/dimensions labeled). PAINT (Full cans without rust or mildew) Water-based less than two years old. PLUMBING & KITCHEN/BATHROOM FIXTURES (Must be clean and in usable condition. Toilets: Complete with all pieces (cleaned/water emptied). Any Children’s Items including: strollers, high chairs, cribs, playpens, changing tables, car seats, toys, jungle gyms, sandboxes, swing sets, etc. Vanity tops are not accepted unless matching cabinetry is included. All donations are tax deductible and all items must be valued by you, as the donor. Please note, donated items are sold at our Restore locations in “as-is” condition. Any items needing repair cannot be accepted for donation. The driver and the ReStore staff reserve the right to decline any items.